Investment opportunities cross our desk on a fairly regular basis, but the vast majority of them are unworkable for any number of reasons. Most commonly, properties are simply overpriced, making redevelopment financially impossible. Other opportunities have a financial path, but only with a zoning variance that we don’t have perfect confidence the ZBA would grant. Geography also comes into play, as we have to take into account the immediate neighbors as well as the surrounding neighborhood. For many of the reasons listed above, we balked a couple years back when we learned that 2201 E. Somerset St. was listed for sale for $5.3M. On its face, this is a fascinating property. It covers an entire city block, roughly 2.3 acres. It’s currently home to a large industrial building and some vacant land, but the IRMX zoning allows for retail and residential uses by right. It’s on the edge of Port Richmond, a neighborhood where we’re seeing increasing development activity, so this is a great time to make an investment here. But the property has also got some major warts. It’s true that Port Richmond has seen a spike in development of late, but this neighborhood is huge and this property sits near its western edge- most of the development activity has happened south and east of here. The Harrowgate neighborhood is just north of here, and from a real estate development perspective, that’s not a major selling point. 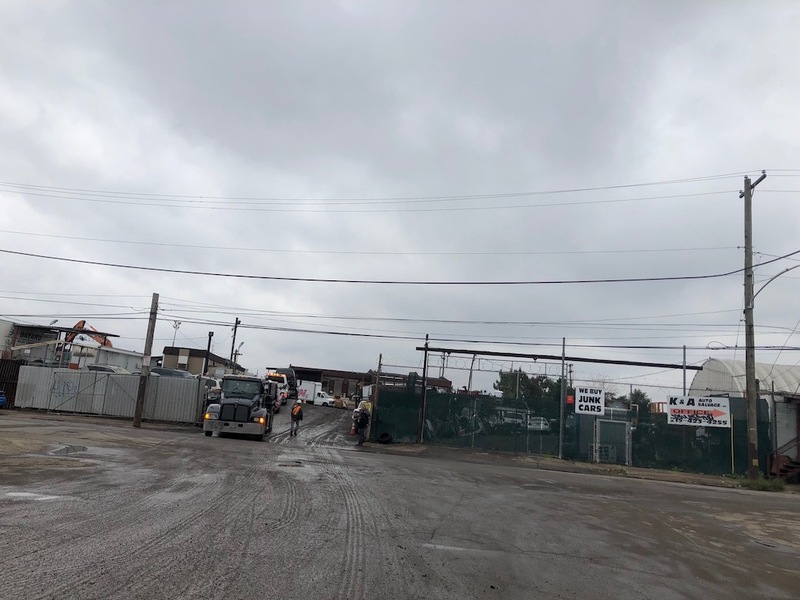 Perhaps the biggest demerit though, is the presence of the Philadelphia Metal and Resource Recovery scrapyard right across the street. You may recall, there was a sizable fire here over the summer, and the smoke plume was visible for miles around. Beyond the scrap yard are railroad tracks, then the Olde Richmond neighborhood, but it’s a rough walk under some serious overpasses before you get to Lehigh Avenue. Those issues gave us pause, but of course another developer has stepped forward to buy the property and is now looking to build an audacious project at this location. Somerset St LLC bought the property in the spring, paying $2.725M, a sizable discount from the original asking price. 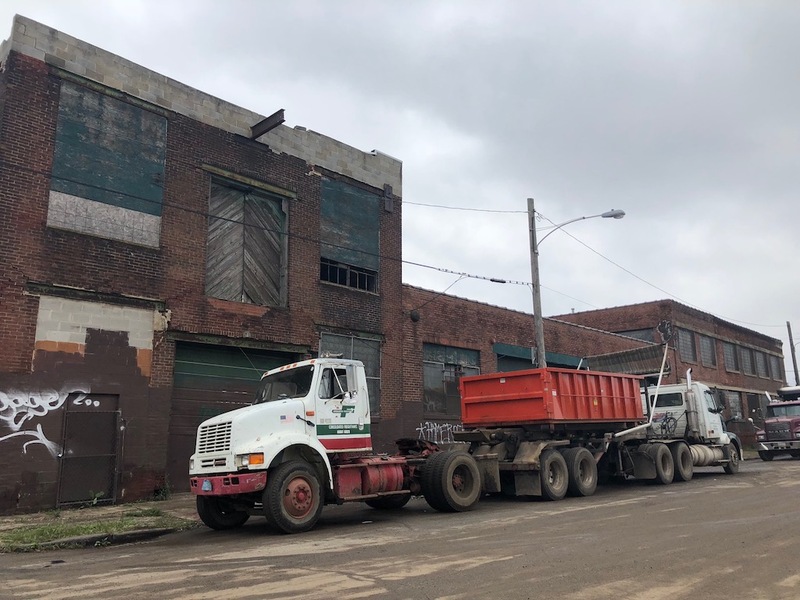 The developers presented to Civic Design Review earlier this month, with a plan to tear down the existing buildings on the property and rebuild the entire city block. The site plan gives you a sense of what the developers would like to build. 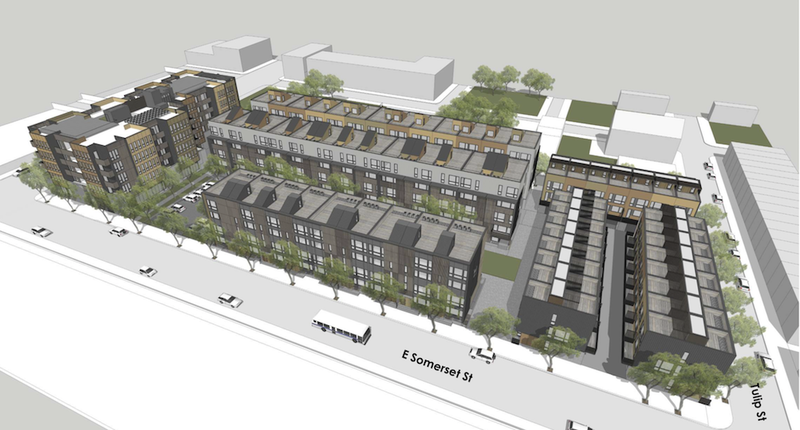 The plan calls for 23 single family homes on the eastern side of the property, each with one-car parking. 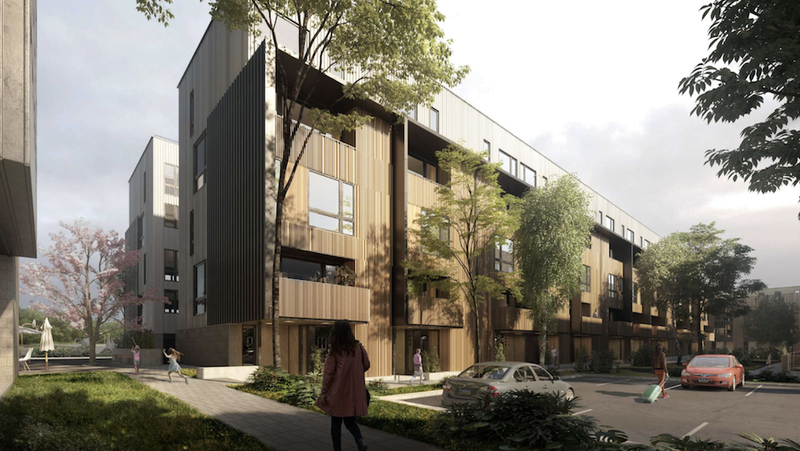 On the north side, we see two rows of 12 duplexes, each with two-car parking. 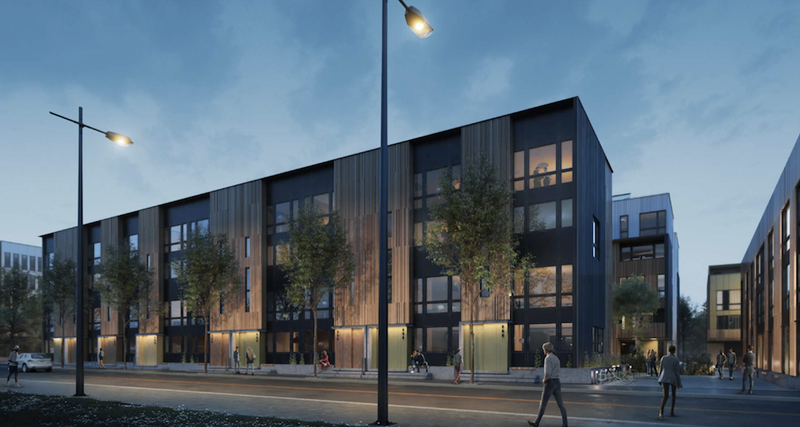 The south side gets 9 more duplexes, each with one car parking, along with a 16-car surface parking lot. 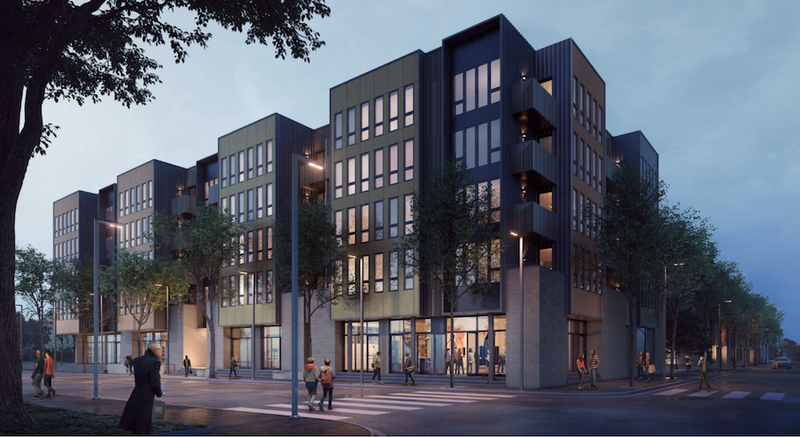 Finally, the west side calls for a 5-story mixed-use building with 60 apartments, retail space, and a few artist studios. Atrium Design Group did the architecture for the project and as we’ve come to expect from them, the renderings look terrific. 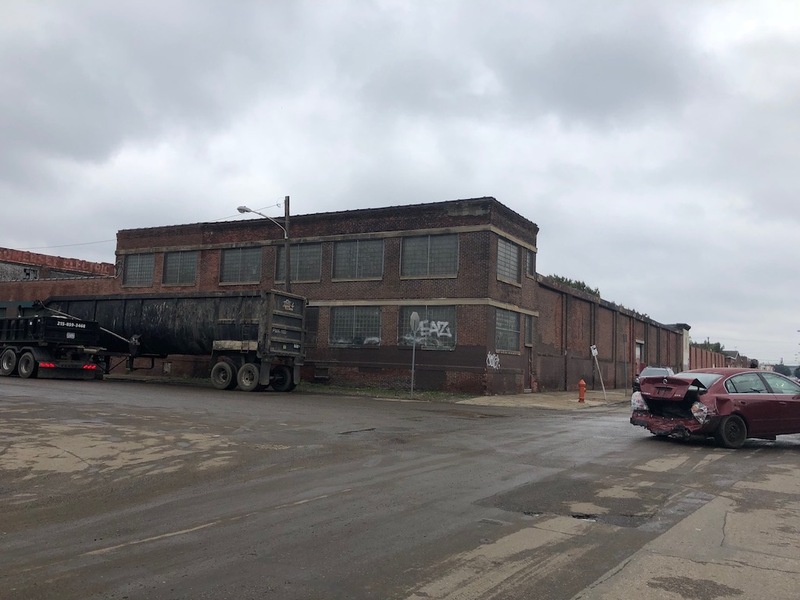 Like we said, a project of this size and scope at this location is quite a shock to us, but could be a game changer for the neighborhood if it actually moves forward. 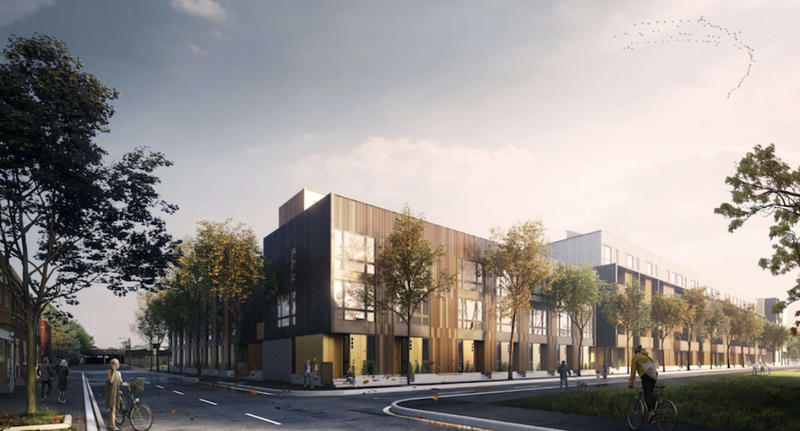 Unfortunately, it seems the local RCOs are not too keen on the project, with concerns about scale, density, lack of sufficient commercial space, and an assertion that the project doesn’t create assets for the local community. We would argue that swapping a rough looking industrial building for a couple hundred new residents and some new businesses would be a huge asset for any community, but we confess that we didn’t attend the community meetings and don’t understand the hyperlocal politics in this part of town, so we don’t know what the neighbors would prefer instead of this project. Ultimately, it’ll be up to the ZBA to decide what happens here and as usual, we’re hoping for a ruling in the affirmative. Assuming it doesn’t get continued, we should get more clarity as soon as tomorrow’s hearing. O lord, density and scale? Compared to what, the boarded up buildings and scrap yard across the street? And what does creating assets for the community even mean? I hope this project goes through and sticks it to the neighbors. Jealous NIMBYs strike again. 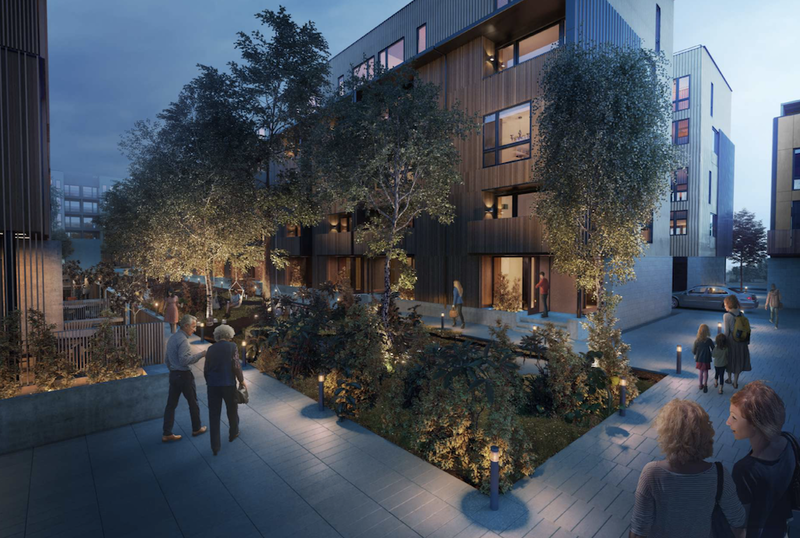 It’s a great looking project and infinitely superior to 99% of what currently exists in that neighborhood. Too much density, not enough commercial. Someone needs to explain how this works. This proposed construction is a hell lot better over what is present. Do we.need NIMBIES to kill a great project? Surely, some part of the lot could be used as a pocket park or playground or something to appease neighbors. The density seems fine since the project is located a couple blocks from Somerset station. I’m sure something can work if some negotiation happens. Looks beautiful and yes, much better than what’s there. But what about the context? Railroad tracks, scrap yards, opioid crisis, lead contamination. Seems like a risk. But folks looking for new construction with parking will certainly overlook all that.